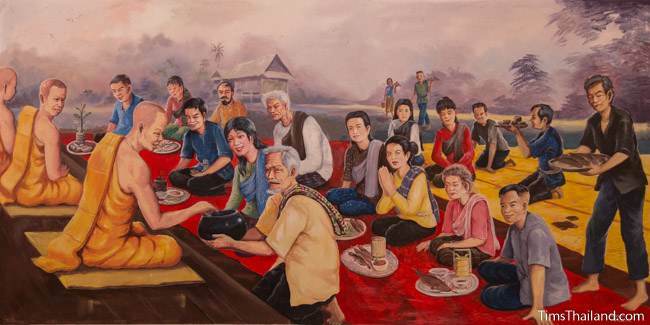 Boon Khao Sak (บุญข้าวสาก) is Month #10 of Heet Sip-Song – The Twelve Isan Merit-Making Traditions. Boon Khao Sak is the follow-up to Khao Pradap Din from the previous month, and the two are very similar. Boon Khao Sak is also a ceremony for the ancestors, but this time it's a farewell since it is time for them to return to the spirit world. In the morning, good food, such as fish, fruits, and sweets, are specially prepared for the monks. The featured food for this heet is the old simple version of krayasat, a Thai snack made of sweetened puffed rice. In the Isan language it's called both khao dawk-daek (ข้าวตอกแตก) and khao sak, hence this ceremony's name. In many (probably most) places, everyone giving alms at the temple that morning will write their name on a piece of paper, and then after praying and chanting, the monks and novices draw lots to see whose offering they will receive. After the monks get their share of the food, people put the rest of it out around the temple (usually on the ground under a tree, atop the boundary wall, or in a tree) for their ancestors. Then they do the standard gruat nam water ceremony to pass on merit to their ancestors. After the temple, people take food offerings out to their farm fields for the Phi Ta Haek land spirits and Mae Phosop, the rice goddess. Boon Khao Sak happens on the full moon day, 15 days after Boon Khao Pradap Din.